The first view upon entering this space is of the seating area with its gorgeous leather Knole sofa and pair of ivory club chairs. The chandelier is just gorgeous, don’t you think? And did you notice the metallic ceiling? 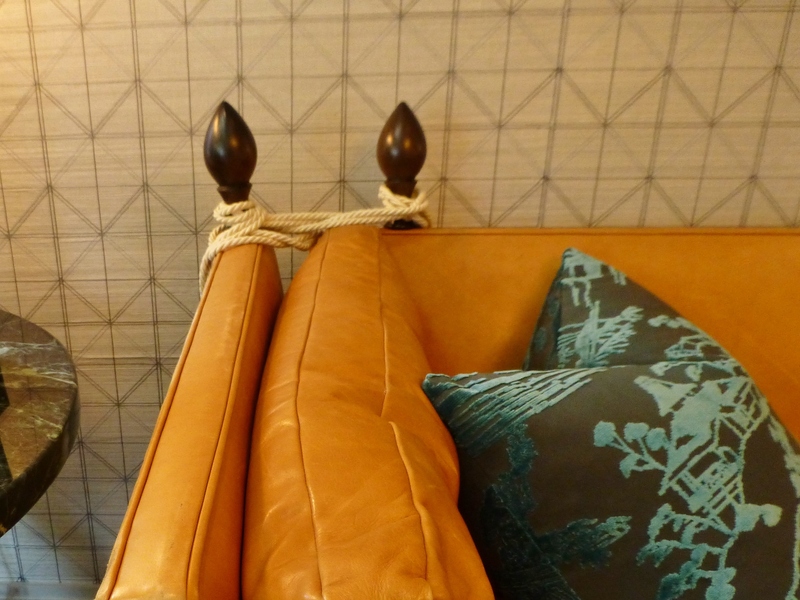 A detail of the Knole sofa. This iconic furniture style features adjustable side arms and deep seating, it usually has exposed wooden finials at the rear corner tops. The arms, more correctly sides, are generally the same height as the back and can be lowered to create a bed of sorts. These side arms usually are tied to the sofa back by means of heavy decorative braid, often with an elaborate tassel. The leather on this particular Knole sofa was a buttery caramel color, and so very soft to the touch! The cut velvet Chinoiserie pillows were soooo pretty as well. The ivory club chairs feature brush fringe along the cushion seams. 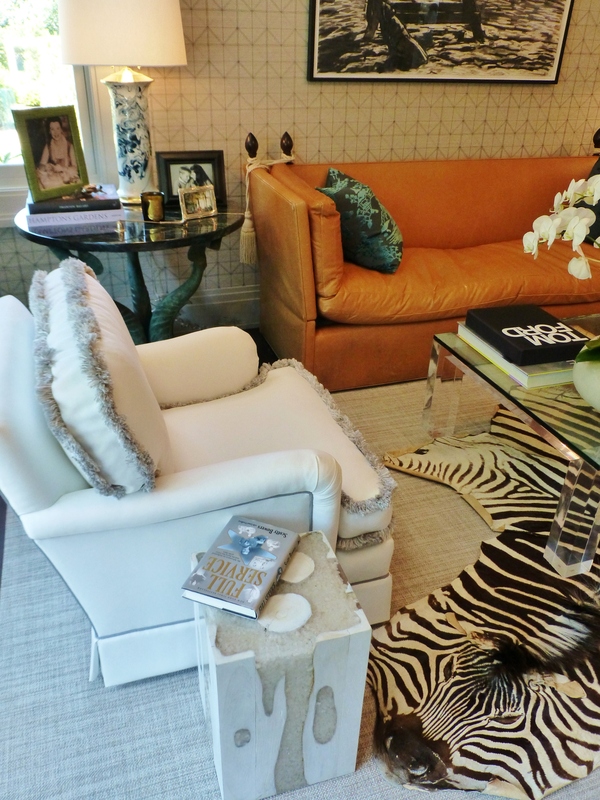 Notice the sisal area rug is layered with a real Zebra hide rug (which includes a face!!). 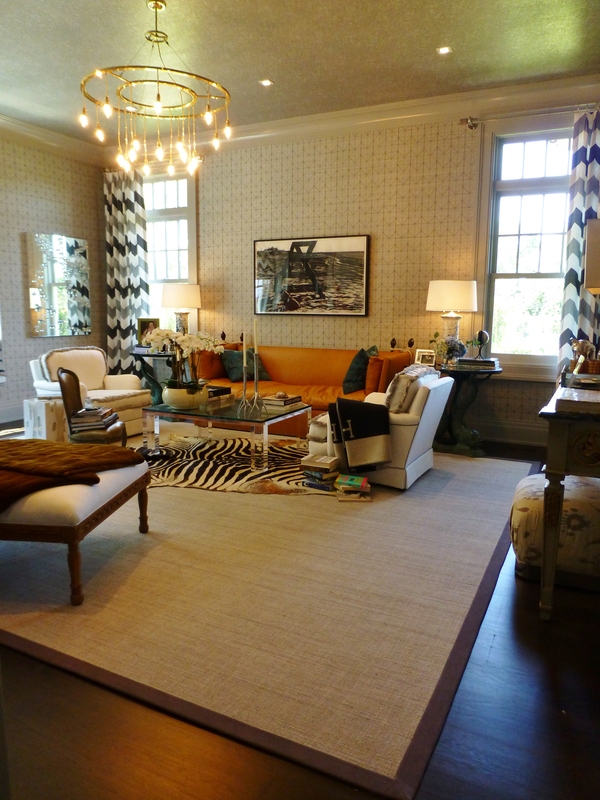 Animal skins were a popular recurring theme in this year’s designer showhouse, but this one was a complete hide. One of my favorite items in the library was the small white drinks table beside the chair. Here’s a detail of the square white drinks table. It appears to be bleached wood with a chunky clear epoxy poured into the voids. I’m not sure of the actual composition, but I think it’s wonderfully interesting! I’m really loving the current practical trend of using these sculptural tiny tables adjacent to comfy seating. To the left of the main seating area was this ample window seat overlooking the front lawn. 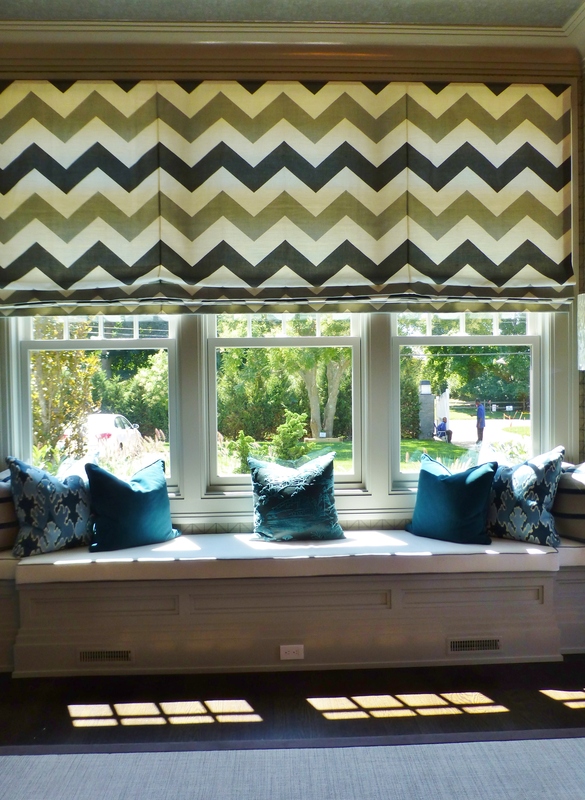 The designer chose a graphic chevron pattern for the single large roman shade and the adjacent drapery panels too. Custom pillows in contrasting shades of blue and teal look so inviting here! Across the room is an ornate, painted and gilded console table with an antiqued mirror above. 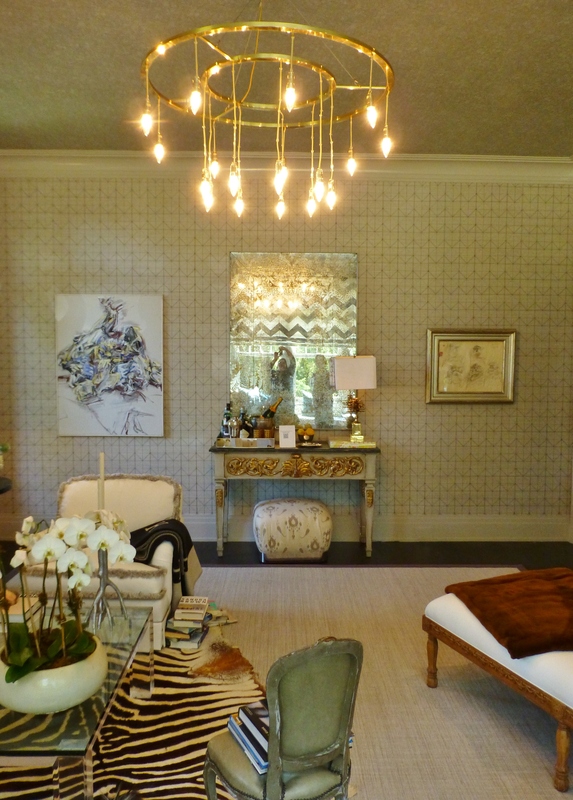 Beautiful antiqued mirrors were another recurring motif at the 2014 Hampton Designer Showhouse. Here’s a detail of the large antiqued mirror above the console. It actually has reverse gilded (eglomise) patterns on it–absolutely gorgeous! The brass pinecone lamp is interesting–it looks vintage to me. I also thought this was a terrific location for the designer to place a tray of beverages, creating a make-shift bar area. Something every library should have, don’t you think? 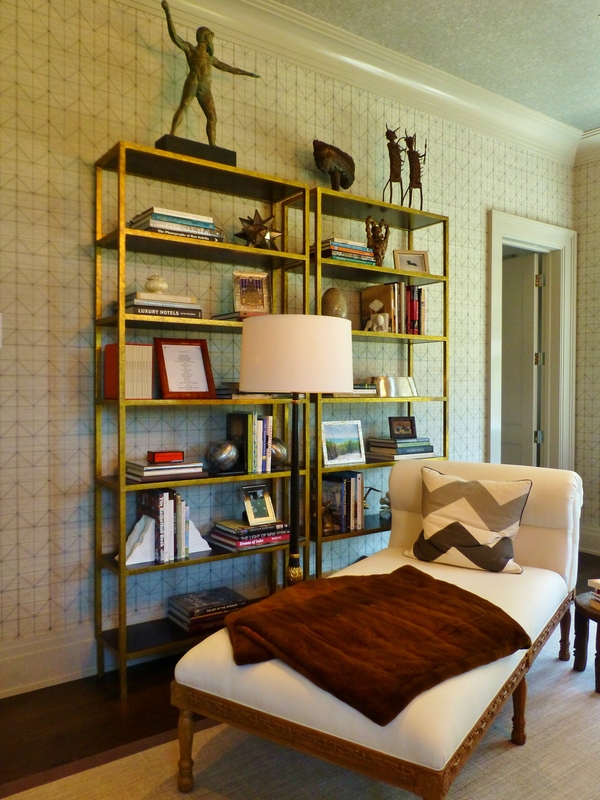 On the room’s entry wall the designer placed a pair of clean-lined gilded etageres. 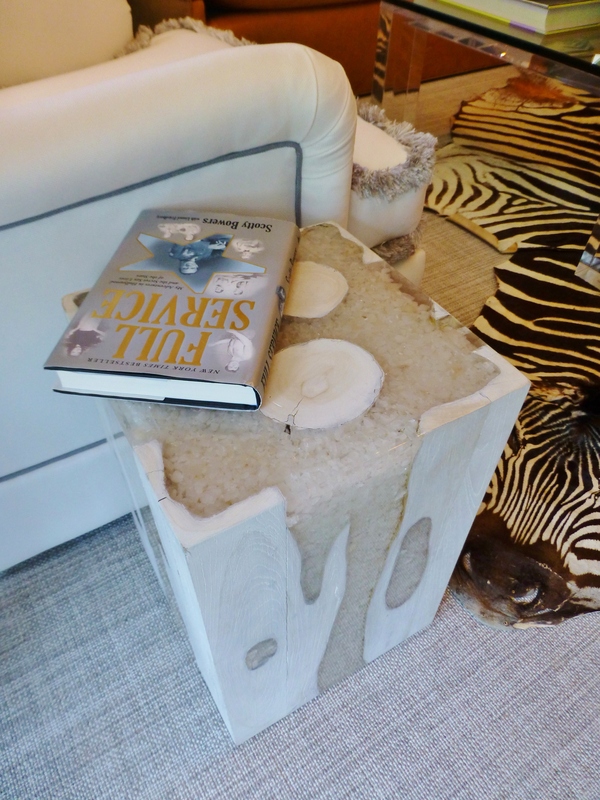 Beautiful and interesting accessories were artfully arranged near an oversized chaise lounge. I thought the placement of that beautiful floor lamp was an interesting choice–in front of and between the shelves and the chaise. 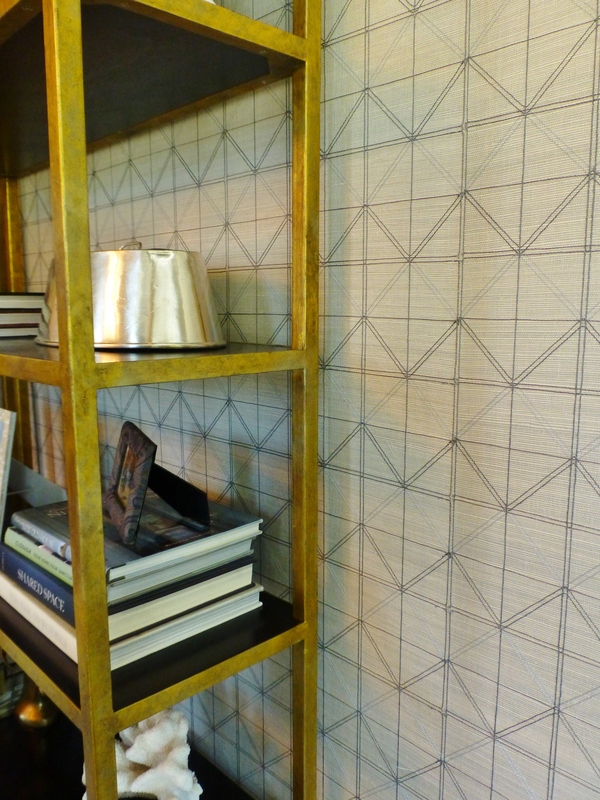 This image shows the absolutely gorgeous grasscloth wallcovering with its geometric embroidery. The embroidered threads are in two colors and provide amazing texture to the walls! Just off the library is this beautiful full bath. 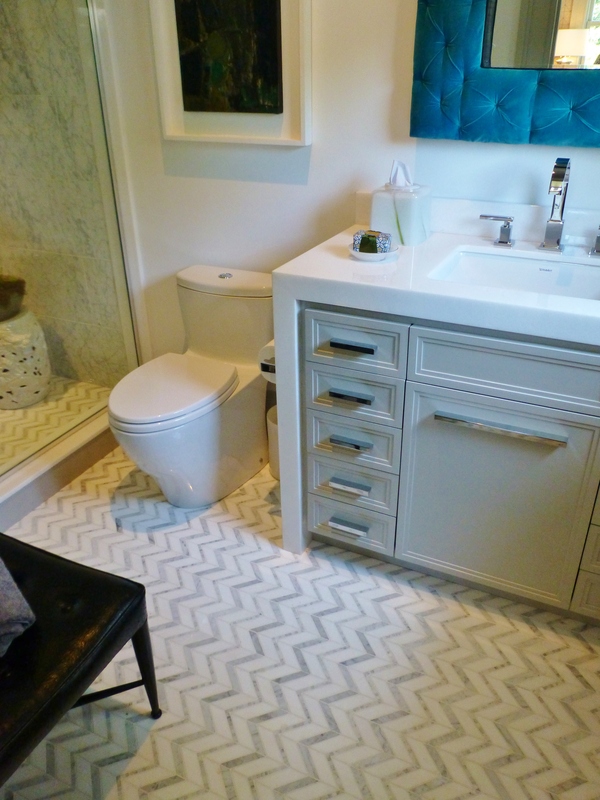 The chevron tile floors echo the window treatment fabrics in the adjacent room. 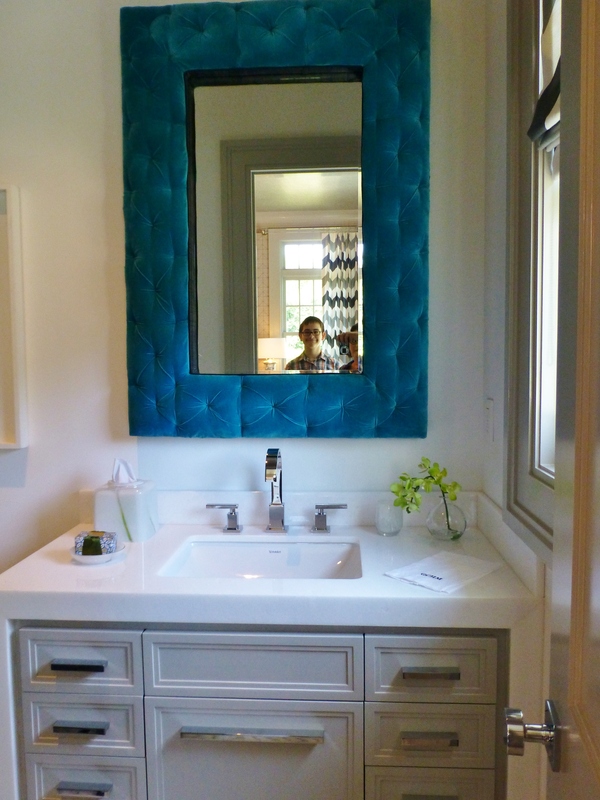 Notice the white waterfall countertop on the vanity and how it wraps around and down the side. The bathroom mirror was wonderful! It has a teal tufted velvet frame, which softens all the hard surfaces in this space. The reflection shows the chevron draperies in the library, and my wonderful son, Grady too! We have such fun touring these properties together. Until next time, don’t forget to tell everyone you know about Kristine Robinson’s Interiors…I need all the friends I can get! This entry was posted in Designer House, Interior Design & Decorating, Library, Robinson Interiors, The Hamptons and tagged accessories, Chandelier, Draperies, Eglomise, Etagere, Furniture, Greg McKenzie, Hampton Designer Showhouse, Knole Sofa, Kristine Robinson, Library, Zebra. Bookmark the permalink. 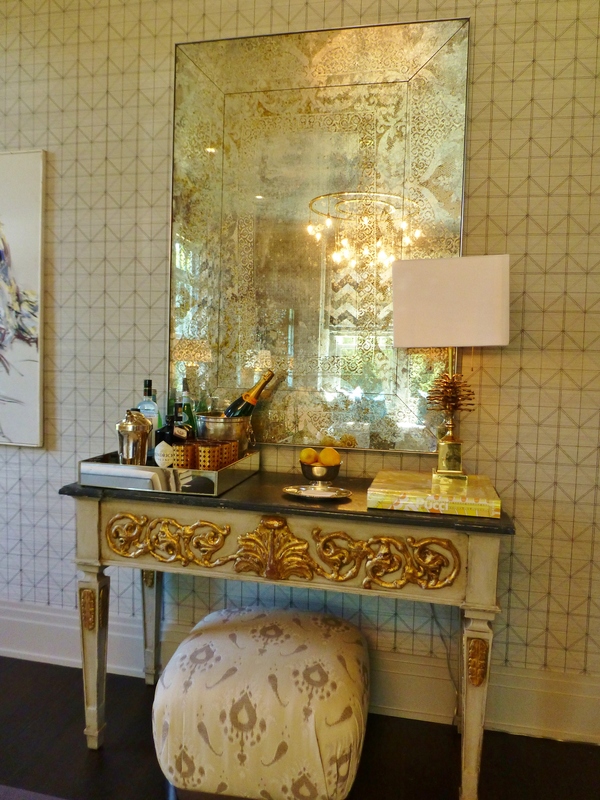 I Love that console table and mirror! Thank you for the tour, you always take such great pictures!